Sounds like an REM song doesn't it. The title is actually a white paper I co-wrote with Brady Forrest and Jack Wilber for Webinale 08 in Karlsruhe, DE. I'll be speaking at the event in May this year. Ich liebe Deutschland!! I caught a weird Twit from a friend who forwarded it to me. Scott Barnes, an evangelist for Microsoft, made fun of LiveCycle by pointing to a 1988 demo of a Wang document with rudimentary voice, CRUD and digsig features. In his twit, he labeled it "the best Adobe LiveCycle sales pitch i've ever seen.. well done Adobe". The twit (note: using the word "twit" to refer to the twitter entry in this case; not the person who wrote it) can be found here. I got curious to know why he is picking on LiveCycle and followed it to the MossyBlog. Being Canadian, I know that moss usually grows on things that do not get enough direct sunlight and has a way of sucking the life out of the host. It is curious to see a blog use this metaphor as its primary moniker. Nevertheless, after reading a bit and becoming completely bored, I have to surmise that he is getting paid to knock LiveCycle, has not seen a demo (most demos involve Microsoft technology too such as office, Win 2003 server, .NET framework 1.1 and more), and has no idea what LiveCycle ES is. I only hope that someone at Microsoft realizes that Adobe and Microsoft have worked together very hard to bring LiveCycle to the market on the Microsoft platform. We have worked hard on the development of standards and protocols for the WS-* stack, including WS-Security, the Kerberos protocol, integration with Active Directory and much more. Most intelligent document workflows start out authoring documents in Microsoft Office so we need to work together for the benefit of the customer. Yes - we do compete in some areas but increasingly, both companies are working towards a common good - satisfying their customers! Makes me curious why he would willingly mock all the work Microsoft and Adobe have done together over the years. I guess when you only blog and don't spend time in real customer engagements, this cause might get lost. Nuff said! Apple OR pear shaped AIR application? 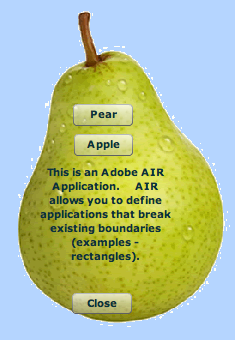 I was challenged by a reader to build an Apple shaped application in Adobe AIR several months ago. I got an interesting email today asking if such an application could be shape shifted during runtime to change between being Apple and Pear shaped. The application is very simple yet demonstrates how to build apps that escape conventional boundaries such as rectangles. You may download the complete source code for the project here. 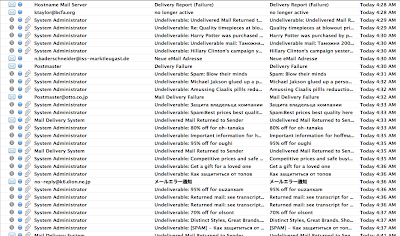 SPAM war deepens - am I winning? This has not resulted in one single person complaining to me which is great. It means that the average recipient has enough intelligence to understand that the true spammer is using the email addresses of those who fight spam as the "sent from" address. So what can we do now? I am working with a few agencies worldwide to find this particular culprit. The Chinese government is very hard on those who break laws and will likely severely punish any Chinese citizen for this. The Russians are less accommodating however I have heard that you can easily hire "third parties" to take care of business in that country.